The preface to the text actually gives little information concerning the Geographical text which is to follow. But, it does illustrate a lack of knowledge by Al-Idrisi concerning the Norman Hierarchy. It is full of hyperbole and praise for their works and thus can only be seen as an attempt by an employee to present his master in the best possible light. It does however contain one gem of information regarding the basic material required to produce his planisphere, a circular map cast in Silver. The prologue attempts to set down the parameters of the Earth’s surface and illustrate the oikoumene from the texts of previous geographers, including Claudius Ptolemy and his Climate subdivisions. The two sections are dealt with separately to explore the whole text therein. King Roger II actually held the lands of Sicily, Apulia and Calabria. His lineage was that Roger 1st ruled Sicily and his nephew Roger Borsa was Duke of Apulia and Calabria with his great nephew Richard II of Capua, Prince of Capua. Roger 1st died 1101AD to be followed by his first son Simon who died 1105AD therefore allowing his second son Roger (II) to inherit the County of Sicily. Al-Idrisi praises Roger II for his knowledge of mathematics and literature and even states (without proofs) that Roger II made a study of the sciences which led to the most extraordinary discoveries. We are given one very compelling measurement by Al Idrisi, that it would be cast from 450 Roman pounds of pure silver. The aside comment regarding the Drachma is problematical as there were at least two ancient weights and after the Roman occupation and then the Byzantine occupation it changed considerably. But the Roman Pound was well known and thus the whole description can be analysed. Roman weights are as follows; Roman Livre (pound) =11.6 ounces of 27.225 grams. Thus if we use for analysis a silver plate, 5 millimetres thickness the weight per square centimetre is thus 5.425 grams. The 5mm is a reasonable estimate for a cast plate as opposed to a beaten plate. Therefore, 450 Roman Livres each weighing 328.9 grams (11.6 oz) equals 148005 grams. This is to be divided by the thickness 5.245mm which produces a surface area of 28218.3 square centimetres. That figure, 28218.3cm2 is a square of c168cm, or a circle (a planisphere) of Silver at c190cm diameter. As Roman weights were used it is natural to assume the measures may have been originally Roman. The diameter would thus be 6.4 Pedes, or 100 Roman Digitus which are 1/16th Pes. However, it is worth quoting the Arabic measures and particularly the KATHOUAH or double step which was the equivalent of the Roman Passum (2 paces of 2.5 Pedes). It is the 1000th part of the Arab Mile, equivalent to 3 cubits Deraga Akhadan or 4 cubits Deraga Cabda. Thus with the two measures giving a single length of 192 centimetres we can observe the probable real diameter of the planisphere. From that measurement the raison d’être for the amount of Silver and the diameter chosen came. Thus, 4 deraga cabda, cubits, contain 4 x 24 fingers (assbaa) giving a total of 96 assbaa. Allow that the external circular strip of the Planisphere is for the engraved titles and scribe a circle 90 assbaa diameter and there exists the mathematical basis for the whole diagram. The world is 180 degrees represented by 90 assbaa and then the internal structure can be mathematically assessed. The World circle is 180 degrees, the oikoumene circle is the scribed as 162 degrees (that is 2×9 less) and as text cgId3 has clearly shown the following units are all part of one system. The radius of the equatorial climate is 90 assbaa, with the final climate line 64 degrees or 32 assbaa radius. Diagram cgId4/D03 has a full explanation of its geometry. But it must be noted that if the Roman Measures of 100 Digitus was in fact used then the same logical numbers of 100 outer circle and 90 Digitus inner circle representing the Oikoumene still appertain. And finally, “I have given to this work the title, “Recreations of man desiring to know thoroughly the various regions of the world.” That of course is the translation from the French text, but the direct Arabic translation reads;’ Nuzhat al-Mushtaq fi Ikhtiraq al-Afaq’, or ‘The delight of one who wishes to traverse the regions of the world’, or more simply’ al-Kitab al-Rujari’, the’ Book of Roger’. “This work was finished in the last days of the month of Chewal, the year 548 of the Hegira ( which corresponds to mid-January 1154AD)”. The Hegira is the flight to Medina by Mohammed on the 15th June 622AD, to the city of the prophet from which begins the first Arabic Calendar. As a previous text cgId1 illustrated the hyperbole by Al-Idrisi in describing places and peoples he has no actual knowledge of is in today’s terms worthy of a “publicist”. And thus we must look to the actual historical happenings, the intrigues, wars and family travails that influenced Roger II of Sicily. Thus statements by Al-Idrisi concerning Roger II, such as discussing with geographers on a daily basis their work must be seen as part of the deliberate attempt to portray Roger II as a ‘renaissance man’, well versed. The Normans established States for themselves from the 9th to the 12th centuries. In 896 Danish Vikings settled at the mouth of the River Seine and in 911 at St-Clair-sur-Epte an agreement was reached between the Viking Leader Rollo and the Frankish King Charles the Simple (898-923) that Rollo received the occupied lands as a Fief and in exchange assumed its defence. Then after his baptism in 912, Rollo became Duke and vassal to the King with the Fief becoming a Duchy. From this beginning the Normans moved in large numbers to Lower Italy and there Robert Guiscard, 1059, acknowledged the Pope’s feudal authority at the Synod of Melfi and became Duke of Apulia and Calabria. At this period another branch of the Norman family was engaged in the conquest of Britannia. Duke William of Normandy had invaded in 1066, and this no doubt gave Al-Idrisi the information to write his text concerning L’Angleterre as text cgId1 explains. But there is a more important thread to the storyline given later. During this period the Normans put an end to Byzantine rule in lower Italy and also to that of the Arabs in Sicily, with the conquests of Messina, 1061 and Palermo, 1072. In 1130 Roger II (1105-1154) united Sicily, Calabria and Apulia into one kingdom and made Palermo its capital. He then conquered Amalfi in 1137, Naples and Gaetaia in 1139. In the 11th century there were 3 serious factions in the East; the Abbasibs held power in the Eastern Islamic World; The Fatamids held the Maghrib and formed the Egyptian caliphate; The Byzantines held the Levant, Asia Minor, Greece, Dalmatia and of course Southern Italy for a while. The Caliphate of Cordoba held southern Spain and the North African Littoral, the homeland of Al-Idrisi. Spain since 718 was subject to many attempts at ’Reconquista’, but it was some 800 years later that the last Arab Iberian state fell in 1492. But in 1071 the Seljuk Turks invaded the Byzantine Empire, Asia Minor, from the east and eventually Jerusalem was in their hands. Thus a new power arrived upon the scene, Seljuk Turks. During that period, in 1095 when Spain was centuries away from freedom and Al-Idrisi’s clan held sway, Pope Urban II, on the 27th November 1095 announced a call to arms, the 1st crusade. The nobles who signed up for the Crusade included Robert, Duke of Normandy and Bohemond of Taranto with his nephew Tancred of Roger II family. The first battle saw Nicaea fall in the June and then the army moved south taking Antioch also in June, but 1098.The Crusaders were dealing with the Seljuk Turks in the North and the Fatamid Arabs in the South who came out of Egypt to retake Jerusalem from the Seljuk Turks. Finally in 1099 the Crusaders reached Jerusalem and in the July the city capitulated. The spoils were divided and Godfrey of Bouillon, Duke of Lorraine was elected as Defender of the Holy Sepulchre. Robert of Normandy returned home, Tancred directed raids into Galilee, consolidating territories there and Bohemond held Antioch. In 1101 more Crusaders set out from Europe and were defeated by the Seljuk Turks, but Tancred and Bohemond, the two Norman leaders, after many problems were still in effect de facto leaders, but Tancred dies in 1112. Then the Muslims, Arabs, are as much at war with the Seljuk Turks as were the Crusaders. The second Crusade commences in 1147 under two Kings, Germany and France, but with serious tensions within the alliance. A useful ally could have been Roger II of Sicily, a Norman Lord who, in addition to Sicily owned much of Southern Italy. However, Pope Eugenius III had fallen out with Roger II and thus the benefits of a possible third Army were lost. Roger II had experience in fighting the Muslims, having taken Malta and after several attempts, Tripoli, establishing a Norman Colony on the North African Littoral. He also had a substantial sea force. Unfortunately though Roger II had caused problems with his claim to both Antioch- as Bohemond’s nearest relative male heir- and to Jerusalem after his Mothers short second marriage to Baldwin 1st in 1117, where a contract had been signed promising that Roger II would be the successor. 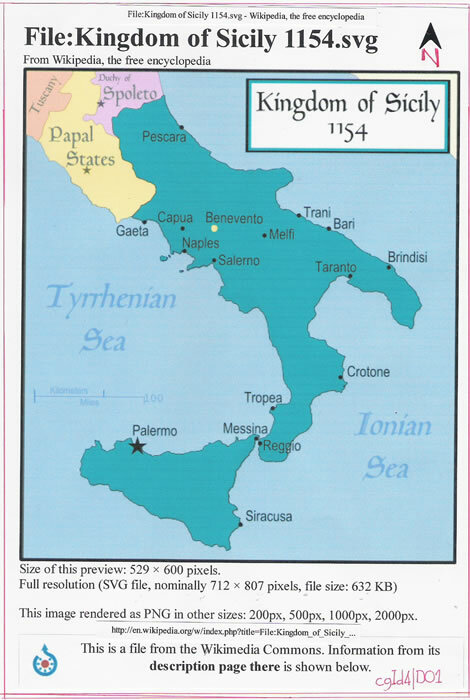 These claims and the problem with the Popes, because of their suspicion of the growth of Norman power in Southern Italy led to much strife and internal warfare from 1127, when Roger II claimed Apulia and overlordship of the Principality of Capua. There followed some 10 years of wars and rebellions, some of which he lost in battle, culminating in the loss at Rignano in 1137. In 1139, following the defeat of the Popes Army, the Treaty of Mignano was signed and the Pope proclaimed Roger II as Rex Siciliae ducatus Apuliae et principatus Capuae. Thus the original conquered lands were returned and remained as the Kingdoms of Naples and Sicily for nearly 7 centuries afterwards. The Byzantine Emperor Manuel meanwhile had problems with the Crusaders and the Seljuk Turks of Asia Minor and urgently needed to release his forces to fight in Greece against Roger II who had taken the opportunity with the distractions in Asia Minor to invade. (Previously Roger had already removed the Byzantines from lower Italy). This second Crusade was not a success and the enmity between the leaders and Manuel of Byzantium transferred to a hatred of Roger II of Sicily, as well as a continuing conflict between Sicily and Byzantium. That Roger II was rich enough to provide 450 Roman Livres of Silver is well proven. He gained Gold and Silver from his campaigns in Apulia, 1133, and Greece, 1147, and even minted his own coins. Sicily itself is excellently located for trade between Europe and Africa and had its own staple exports. But consider this; Duke William of Normandy was deprived of his supposed birthright as King of England, date 1066 and his conquest. Roger II was deprived of his birthright as King of Jerusalem, 1117. These are climactic for the Norman Hierarchy and would have no doubt inspired protectionism and thus a desire for knowledge of what was possible. Thus we must ask ourselves if Roger II was so enmeshed in disputes, even with wars, did he have the time to devote to the geographical treatise, that is 15 years from 1139 to 1154, and was the real reason for the Map and Treatise a knowledge of his enemies, their strengths, the distances to them for his Army and Sea Force to travel in times of strife, and thus it became a World Map as he collected more and more information. Situated in the centre of the Mediterranean Sea with hostile nations to the North led by the Pope’s antagonism towards Norman Sicily and surrounded to the North-East and East by the Byzantine Empire and to the South and West by various Arabic Islamic Caliphates, it is probably as stated a matter of know your neighbour and his neighbour so that you may be prepared. Roger II had a large Navy sailing mostly the Eastern Mediterranean who would have required accurate maps, information regarding ports and hostile/friendly peoples. The Byzantine Empire required to be fully explained in its breadth and the origins of the Seljuk Turks, who coming from farther East and impinging upon the Mediterranean life required explaining. Therefore, it is plainly evident that if Roger II added to those places, the Northern European lands, his birthright, and then a conquered Britannia, basically it would only leave the Far East, India and China etc and he would be mapping the world. You are the King of a Kingdom surrounded by antagonists. You require knowledge, not only of the adjacent lands but of the potential threats to your lands from far afield. You know that you may be threatened from a distance, by peoples not really heard of but seen attacking your near and far neighbours. What choice do you have? You are a small nation fighting for survival in the centre of the Mediterranean. You require information, a map of the oikoumene which will enable you to position your enemies, their lands and distances to your Kingdom. But, who can you trust to produce such a map and information? It would certainly not be an inhabitant of the Northern European Lands subject to the Pope, or the Byzantine Empire, or the heartland of the Arab Caliphates, all of whom are antagonistic towards your Kingdom. But, on the outskirts of Europe, the far west of the African Littoral is a Caliphate under pressure from both its own neighbours in North Africa and from the Europeans who would wish to see its demise in Iberia. We must also bear in mind that Sicily had been an Arab possession and within the populace there would be many descendants of those peoples who would know the situation vis a vis the Arab world. Thus we can also posit that their crafts would still be extant and able to be used by Roger II. One person appears, of unknown quantity, having the parentage to gain some respect, “Mohammed Al-Idrisi” or to give him his full title, “Abu Abdullah Mohammed Ibn al-Sharif al-Idrisi”, born in Ceuta, Morocco in 493/1100AD, and possibly belonging to the house of the “Alawi Idrisids”, claimants to the Caliphate, who ruled the region around Ceuta from 789 to 985AD, and hence his title, “al-Sharif (the noble) al-Idrisi”. No primary sources state when Al-Idrisi arrived in Sicily (although historians believe it to be 1138), and the only relatively certain date we have indicates he was present at the court of Roger II in 548/1154AD. Thus the 15 years quoted by Al-Idrisi, i.e. 1154 – 15 = 1139, only one year after his possible arrival places a question mark on the timescale quoted. Thus you have an educated Arab, quite probably conversant with history and geography, somebody who has no connection with your enemies and capable because of the Arab affinity with geometry and mathematics, to construct a map of the world, or rather the oikoumene. Regardless of the plaudits given by Al-Idrisi to Roger II it is questionable, given the general education of second sons, an education in that period given generally by monastic establishments which were few in Sicily given its Arabic heritage, that he was truly capable of mastering geometry, mathematics, geography and astronomy as well as fight so many wars etc. Bear in mind he was only 9 years old when he became Count Of Sicily and his Mother was Regent. But this is not the place to argue his education; he may have been a savant. It would therefore appear that Al-Idrisi was the right person at the right time to prepare a map and geography for Roger II of Sicily. But just how much knowledge did Al-Idrisi really have? There are 9 sections commencing the prologue and each is first written as translated from the French copy text and then an explanatory paragraph is appended to resolve the underlying problems as the text unfolds. SECTION 1; we commence by dealing with the figure of the Earth, of which the description is designed by Ptolemy under the name, Geographia, and invoke the security and fervour and protection of God in all our ways and in all circumstances. Thus we see on the circular maps attached to the texts of Al-Idrisi a 180 degree world and generally a 162 degree oikoumene. However we should note that Al-Idrisi does not state a length of 180 degrees. SECTION 2; the terrestrial globe is divided in two equal parts by the equinoctial line which stretches from west to east; it is the length of the Earth and the longest line possible on the surface of the terrestrial sphere, the same as the Zodiac which is the longest line on the celestial sphere. COMMENT; the equator is stated as the longest line possible on the surface of the terrestrial sphere, but, that actually indicates that Al-Idrisi perhaps did not realise that each and every line of longitude, a colure, on a true sphere would be identical in length to the equator, or that he considered longitude as only a pure north pole to south pole line as he later mentions 90 degrees. SECTION 3; the circumference of the earth is divided into 360 degrees along the equator. Each degree is 25 parasanges, each parasange is 12000 cubits, each cubit 24 fingers and each finger 6 grains of Orge (Barley) ranged and touching one to another back to back. Therefore, the circumference is 132,000,000 cubits or 11,000 parasanges. That is as calculated by the Indians. COMMENT; here in trying to give a measure to the circumference of the world, Al-Idrisi has conflated two measures within the text as we now read it. Possibly this is scribal error, that is omitting a section of text where the figures are the same in the two different parasange lengths. But, as the error is in the oldest copy of the text it is perhaps an error by Al-Idrisi. 360 x 25 x 12000 = 132,000,000 cubits. This is a gross error as the actual maths is, 360 x 25 x 12000 = 108,000,000 cubits. But the next statement, “therefore the circumference is 132,000,000 cubits or 11000 parasanges is correct, i.e. 132,000,000/12000 = 11000 parasanges and provides us with the answer to the error. There are two lengths for the Cubit, one of 640mm, called the Deraga Akhdam and the other of 480mm called the Deraga Cabda, which are of 4:3 ratio in size. Thus we see that 9000 cubits of 640mm is exactly the same length as 12000 cubits of 480mm. 360 x 25 x 1200 = 132,000,000 which both produce the same resultant length of the equator. That is, 51840000 metres, or 51840KM/32213.376 miles and thus considerably more than the actual world of 40009/40077Km geographical world. Thus we may safely assume that the measurements were either misunderstood or conflated. SECTION 4; but, “Herakles” measured this circumference and divided it in equal parts each composed of 100 miles; and thus it was 36000 miles or 12000 parasanges. Starting at the equator there is another line each pole to pole, being 90 degrees and each of these latitudes corresponds to the same measurement. But there does not exist habitable land above the 64th latitude; the rest is desert because of the intense cold and abundance of snow. COMMENT; Al-Idrisi considers “Herakles” (Eratosthenes?) to have measured the circumference, which is correct although the figures used are somewhat strange. But as each Parasange is 3 miles and as Al-Idrisi has stated there are 25 parasanges per degree, we have 3 x 25 = 75 miles per degree. The Roman World measure is 75 RM per degree with an overall measure of 27000 RM, equivalent to 24816.186 statute miles or 39935.93Km. The Roman world measure was thus highly accurate. SECTION 5; the Earth is essentially round but at no point is the roundness perfect since there are heights and depths and the waters flow from one to the other. COMMENT; this is a very profound statement which if developed may have given rise to the geoid. SECTION 6; the ocean sea surrounds a half of the globe without interruption in a circular zone. COMMENT; this is perhaps a worrying statement as half the globe cannot mean a longitudinal sea, but can only refer to a latitudinal sea that encompasses the globe from north to south. That is, it is a diagrammatic sea on a flat plain, not a sea upon the face of a globe as it would have of necessity covered the part of the globe opposite the oikoumene and allowed for no other land masses on the hidden part of the circular map. That is of course a possibility for geographers in those days, but it had been posited that there was a balancing continent on the globe. SECTION 7; the habitable part of the Earth was divided by the experts into 7 climates, with each stretching from west to east. This division has not been set up after natural existing lines, but from ideal or imaginary lines of the astronomers. There are in each climate a large number of towns, forts and villages and of peoples who do not resemble each other. We there find also high mountains, vast plains, the sources and courses of water, tranquil lakes, mines and both diverse vegetables and animals. 1) 13.00h, 160 27’N, Meroe ; 2) 13.30h, 230 51’N, Aswan; 3) 14.00h, 300 22’N, Lower Egypt; 4) 14.30h, 360 00N, Rhodes; 5) 15.00h, 400 50’N, Hellespont; 6) 15.30h, 450 01’N, Black Sea middle; 7) 16.00h, 480 32’N, Borysthenes River mouth. Thus 7 climates from the Equator to 64N (63N actually) is a version concocted after Ptolemy. the Caspian Sea, length coast to source, 1000 miles and to the Volga 650 miles. COMMENT; the 7 Seas or Gulfs are easily identified and the information examined. The inconsistency of measures utilised in the text cannot have allowed Al-Idrisi to proportion the World Map with any accuracy. The distance measures from the mouth of the Red Sea to the farthest east of 4500 parasanges which is an equatorial distance measure and hence the 25 parasanges per degree indicates a world length of only 180 degrees. This is of course nonsense and if Konrad Miller’s map is studied it is obvious it is half length of the oikoumene and therefore half the map length and thus 45 degrees or 2250 parasanges. This would surely indicate the map being read to provide the length, i.e. one half of it and that being translated to half the globe length. The Mediterranean Sea is stated as being 1136 Parasanges in length, which visually equates to half the map length. Thus, 1136/25 = 45.44 degrees at the Equator. The Mediterranean sea is from 5.5W to 36E, a total of 41.5 degrees and thus the Al-Idrisi figure is quite close at 45 degrees. The Adriatic Sea or Gulf of Venice is noted as 1100 miles in length,” from one to the other extremity”, but the text actually describes both coasts, Italy and Croatia/Dalmatia. Thus from Calabria to Aquila it is c900Km, 4865 stades or c500 miles/600 Roman Miles. The Pontus Euxine, Black sea, is noted as being 1300 miles. It is from 29E to 41.5E at 40N and thus geographically 12.5 x 85Km or 1062Km/5740 Stades, with 1300 miles equal to 1803Km or 9750 Stades. The Caspian Sea is given as “ Sa longueur, du cote de la Khozarie, jusqu’a la source du Timour est de 1000 miles, et sa larger depuis la cote Djordjan jusqu’a l’embouchure du Volga de 650 miles”. Curiously the maps indicate a length and width equal and thus perhaps we should interpret these measures as coastal distances as was indicated in the text cgAr1, The Aral Sea. SECTION 9; the number of tableaux following it is raised to 70 without counting the two extremities, of which the one forms the limit of the habitable places at the south side and the major part of that which is the extreme heat and aridity rendering entirely deserts, and the other the limit of habitable places at the north side, where the excessive cold produces the same effect. At the middle of this methodology the reader sees in the tableaux the true situation and the exact form of the countries, but, if he rests to consider the state of these countries, then he will see their structure or arrangement of parts, their habits, the clothes of the inhabitants, the open routes, and in this way the distances in miles and parasanges , and the curiosities which exist and have been attested by travellers, the sailors and the historians. Then after that, we have judged it convenient to follow each tableaux with a description of places that are indicated; and it is that we propose we do in the present work to as much as our forces are able to permit us and in imploring the divine assistance. COMMENT; there are 70 maps and no mention of a circular world map. But, Al-Idrisi is at pains to point out that the tableaux show the true situation and extant of the form of the countries. That is perhaps his hyperbole taking over, or a statement to encourage his readers that all is correct, or seemingly so. 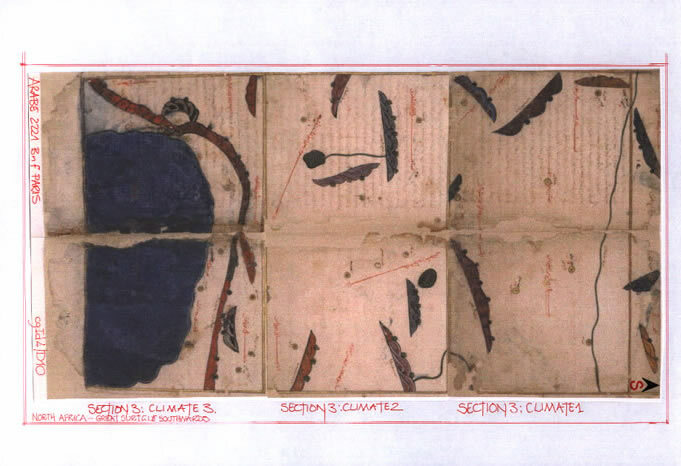 In the last paragraph of the prologue Al-Idrisi explained how he will set out his text with diagrams using the 7 climates as subdivisions latitudinally and then subdividing each climate into 10 sections longitudinally. Latitude of the inhabited world, 63 (64) degrees in 7 climates, each climate is thus 9 degrees height. The text cgId3 fully explains that the 64 degrees is none other than a geometric construct to enable the circular climate lines to be drawn at equal spacing using whole numbers. It is thus 63 degrees. This is a credible proportion, easily adapted to the 70 Tableaux and thus we must consider whether the circular map is a construct in its own right and not therefore the foundation of the 70 tableaux. That is the 1:1.8 ratio should not be carried across the 70 tableaux but they should indicate a 1:2 ratio. Thus we can see that each copy of the original text when redrawn by the various scribes appears to be a concept that the scribe has desired as opposed to a true copy of the original tableaux. But the main reconstruction by Dr Konrad Miller has the proportions 1:2.645 overall and thus each individual map would be 1:1.85 and thus perhaps confirms the use of the 162 degree oikoumene as the width or longitude of the oikoumene as used by Al-Idrisi. There is also a great discrepancy between maps regarding their presentation, particularly the colouration of the individual sections. There is also a content discrepancy which must be accounted for. Within text cgId3 it was shown that the construct of the Orphan Circular Map was completely mathematical and geometrical, the two mainstays of Islamic Art. On the Drawing Board, using Iron Compasses it would have been possible to assess the mathematics and geometry to produce a perfectly geometric World Map .But one parameter must have been the central location of the city of Mecca and its geographical latitude. Thus the investigation of the Orphan World Map produced a raison d’être for its construction, that of a 180 degree outer circle with a 162 degree inner circle for the extent of the oikoumene. But, the Silver Planisphere was of an altogether different scale. It was as has been shown 4 cubits diameter or a Kathouah, the double step measure of 192cm, and the equivalent of 3 cubits Deraga Akhdan or 4 cubits Deraga Cabda. 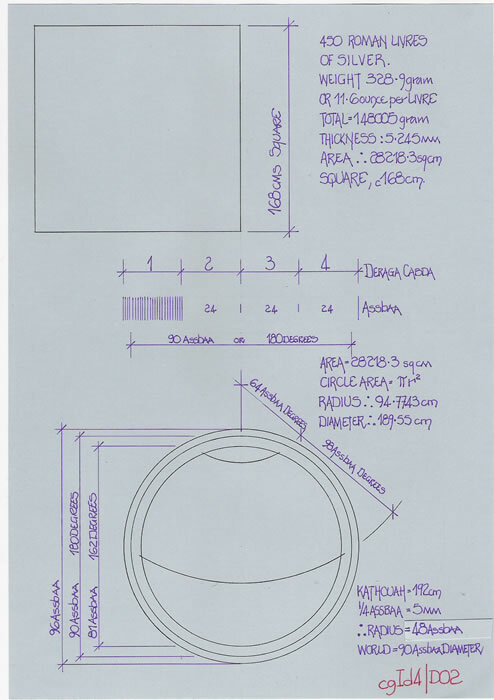 And, as already posited this led to the design size of the internal engraved map, the outer rings being 90 assbaa or fingers in diameter (or 90 Roman Digitus). From this data we can assess the metrology of the whole map. The 90 assbaa is equivalent to the 180 degrees of the Orphan World Circular map and thus the oikoumene diameter is 81 assbaa. These are both based upon the figure 3, such that 90 = 3x3x2x5 and the 81 = 3x3x3x3. If we then investigate the climate circles, which we already know are based upon the diameter becoming the radius, the Equatorial radius is 162 degrees, and then follows the other radii, 148, 134, 120, 106, 92, 78, and 64 degrees. That is 8 lines enclosing 7 climates. But, if they are halved, i.e. the 180 degrees is represented by the 90 assbaa then the reduction is not 14 degrees, but 7 assbaa, that is the units change to represent the actuality, as 90, 81, 74, 67, 60, 53, 46, 39 and 32 assbaa radii. Thus the Drawing Board was used to perfect the mathematics and geometry of the World Circle, such that it could be expressed in simple terms and ensure it could be copied using simple measures on any medium. The Planisphere which was copied from the Drawing Board design, thus need not have been of identical size, but could have been scaled up. However as the instructions are to faithfully copy the design on the Drawing Board onto the Silver Disc it would be sensible to presume that they were both the same size and the transfer made so very simple. The Silver Disc map or Planisphere was displayed at Palermo, whether it was coloured is not known, but it is highly likely given the extent of the seas, deserts and cultivated lands, as well as the rivers and mountains it would have shown. Thus with such a memorial, something never seen before in Europe, it is obvious the final act must have been the drafting of the Orphan Circular World Map, a much reduced, but totally to scale map for inclusion with the final text. The original could not be drawn as it contained much too much information given its diameter, and thus we see an idealised copy to remind everybody of the magnificent original. 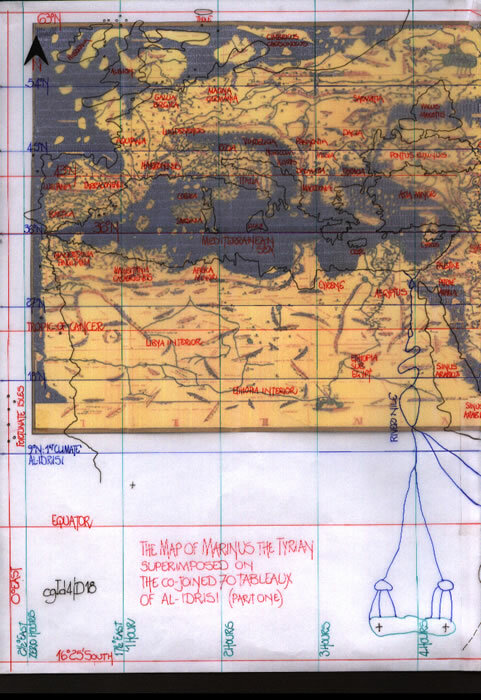 It is quite feasible to print and join together the individual maps from Arabe 2221, BnF Paris and or Pococke 375, Oxford, to produce an overall world map, a rectangular map, for an overview of how Al-Idrisi saw the world. Both series of maps are slightly different in size within the two groups but the end result, although a patchwork is nevertheless an acceptable map. 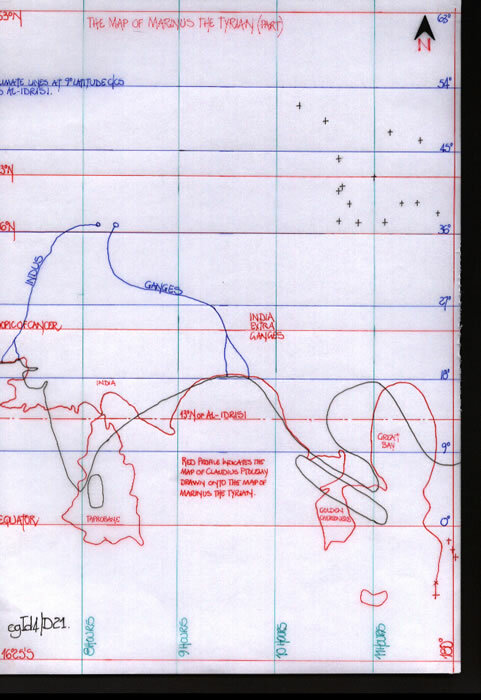 As already noted Dr K Miller carried out this task and published the map with his 1927 book. 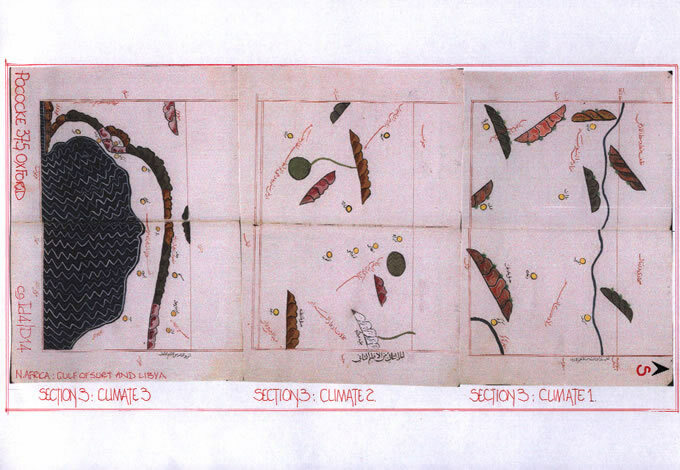 He tells us he used the 70 tableaux from the Pococke 375 text as the basis for his reconstruction, but that cannot be the sum total of the tableaux used as his WeltKarte has features not shown upon either the Pococke 375 or Arabe 2221 tableaux. If we study Climates 1 and 2, sections 1, 2 and 3, the difference becomes apparent. Basically the problem arises over the Rivers and their courses and thus their existence or not on a series of tableaux. 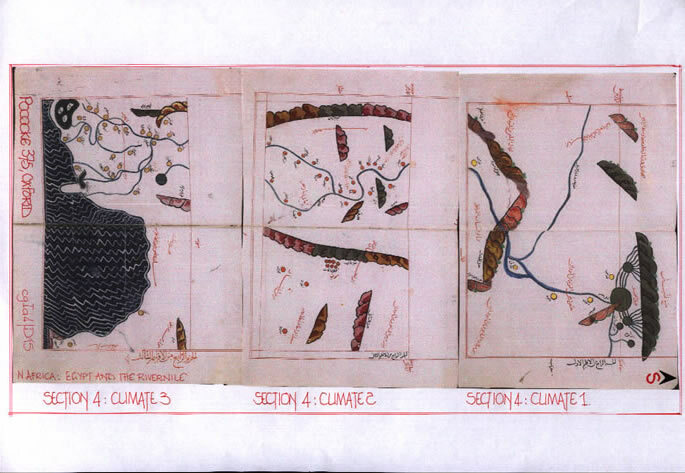 Africa for example in Climates 1 to 3, sections 1 to 4 within the Pococke 375 and Bnf Arabe 2221 diagrams do not have the rivers indicated upon the WeltKarte of Idrisi produced by Dr K Miller. Here it is perhaps prudent to mention that the WeltKarte has drawn along its right hand edge, not only the numbers 1 to 7 for the climates but a latitudinal scale indicating where the geographical latitudes should be. This is not repeated elsewhere; why? Simply put, they cannot be drawn as parallels across the reconstituted map. 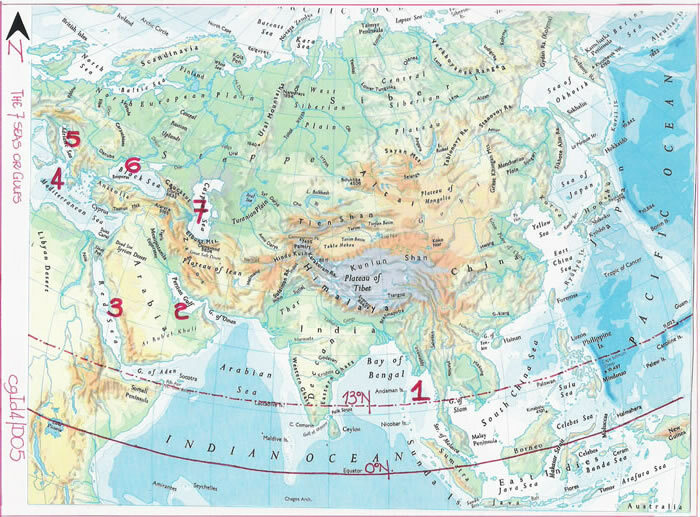 Al-Idrisi has no concept of latitudinal scale within his map and any attempt to portray the actual latitudes indicates the lack of consistency in a north/south alignment. Thus the 7 climates are not true latitudinal subdivisions; they are purely the individual sections which have been drawn to assume a resemblance of the actual geographical oikoumene. There is in fact more resemblance to geographical reality in the text and maps of Claudius Ptolemy, a text which Al-Idrisi informs us he has used to compile his “Book of Roger”, but obviously he never completely read, attempted to draw the maps from the information there-in, or, more likely did not understand the text of Books 2 to 8. That of course assumes Al-Idrisi had a full copy of Claudius Ptolemy Geographia. 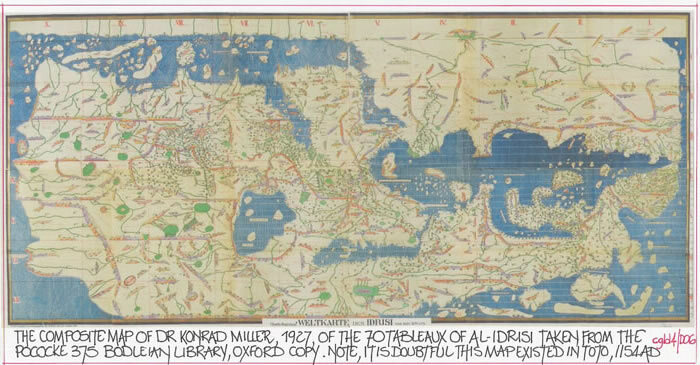 We cannot even assume Al-Idrisi actually saw a copy of the World map of Ptolemy, although the feature of his own maps, the extended coastline of Africa tends to lead to the belief he saw at least the original map of Marinus the Tyrian, (See text Mt1 and Mt2) or a very similar map. Al-Idrisi had to have had maps of the various areas of the world at his disposal in order to formulate his own world map in 70 tableaux. 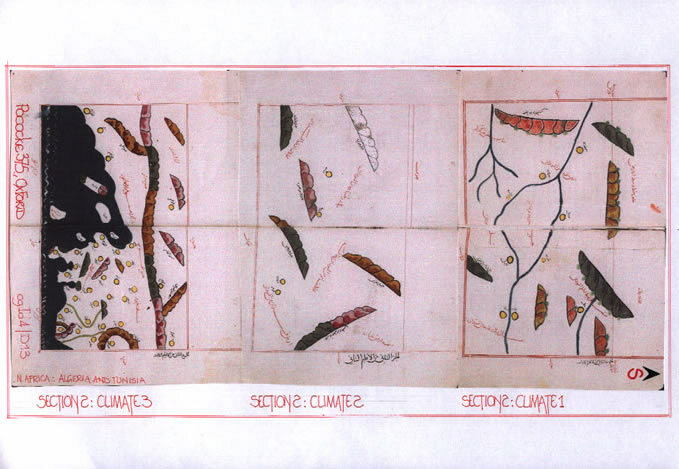 That would have enabled the overall map to be drawn which then permitted the individual tableaux to be copied out. That is the only method which would have achieved the coherence shown by the 70 tableaux. The text descriptions without north/south/east/west given as parameters will not allow the map to be drawn, or even one of the 70 tableaux. The use of Miles, Parasanges and Day’s March also means that without a scale a comparison of each set down to be used nothing can be achieved and a resemblance of geographical actuality shown. THE 70 TABLEAUX; WHAT ARE THEY? The text of Al-Idrisi has only one map form actually determined, that is the circular map first drawn on the “Drawing Board” and then expertly engraved upon the silver disc with a size of 4 cubits diameter. There is no description of the 70 tableaux, their size, construction or geometry. 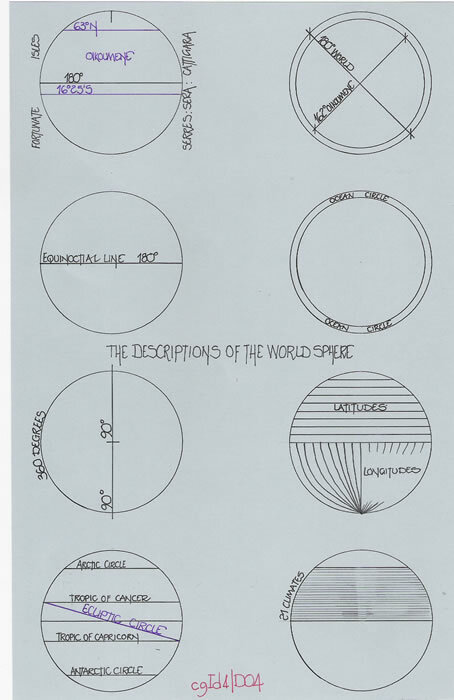 In text cgId3 it was postulated that the tableaux may have been a linear projection of the circular map; that is the Planisphere was drawn and then the climate lines were used to allow colures or longitudinal lines to be drawn and these expanded into a rectangular format. This of course ignores the “Drawing Board” and what may have been achieved there-on. The circular map is drawn with 90 assbaa representing 180 degrees, a very simple mathematical/geometrical problem. But, did Al-Idrisi realise that to draw his map in detail, in sections within a book, each section would be far easier to draw if it was based upon straight lines and a rectangular framework. In other words, the circular map was drawn on the “Drawing Board” and transferred to the Silver Disc, but was its progenitor actually a rectangular map which was easily transferred, redrawn as a circular map. Claudius Ptolemy did not draw a rectangular map, but he informs us that Marinus the Tyrian did, with a scale ratio of 5:4, latitude to longitude, and, the map of Al-Idrisi has features which may have been taken from that map. Thus it is possible there could have been a rectangular map prior to the circular map. It will be evident from the outset that we are comparing two maps separated by 1000 years. 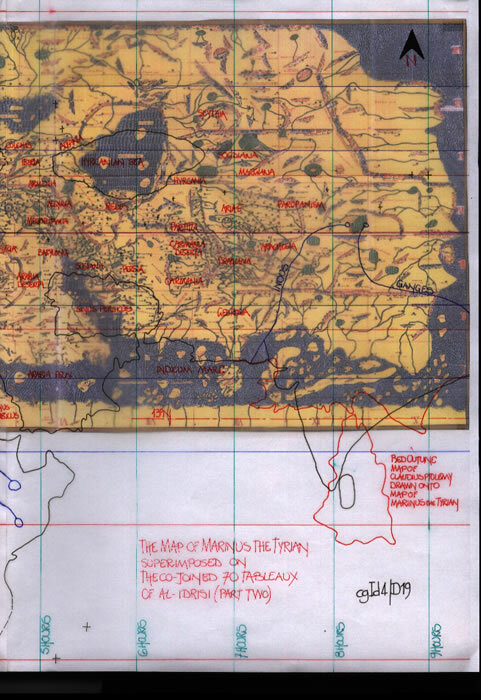 Thus the map produced by Marinus the Tyrian (cgId4D16) and subsequently used by Claudius Ptolemy will not contain details of the lands to the Far East past the Golden Chersonesus, Malaysia. But, there is adequate comparative information available just in the Mediterranean region to show the probable basis for the Al-Idrisi map. 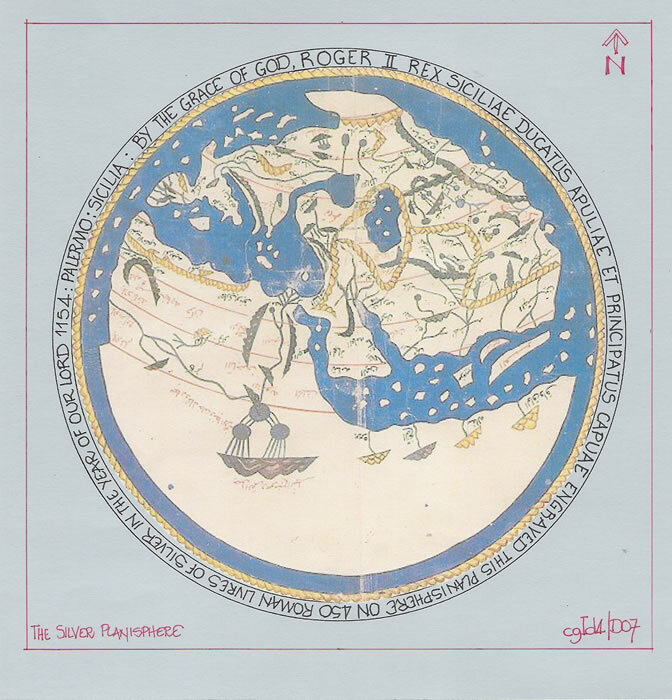 Diagram cgId4D17 compares the World map produced by Dr K Miller from the 70 tableaux with the Map of Marinus the Tyrian. 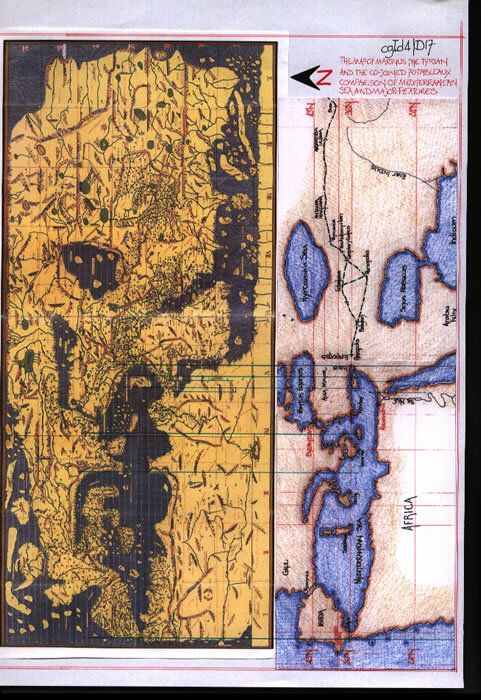 By aligning a map drawn to the parameters set down by Marinus the Tyrian to the Al-Idrisi map at the Detroit, the starting point of the Mediterranean Sea, the first simple fact to be seen is that they can be shown to be the same length from the Detroit to Issus. In fact some of the land features align quite well also; Greece, Cyprus and the Red Sea and also the positioning of the Caspian Sea and Persian Gulf. Moving East, Al-Idrisi has used the Indian Sub-Continent profile as drawn by Claudius Ptolemy, which may have been as drawn originally by Marinus the Tyrian, but that is doubtful. Naturally the East African coastline becomes the northern coastline of the extended continent as it trends eastwards, which is a feature of the World Map of Claudius Ptolemy and not of Marinus. Thus we may fairly postulate that Al-Idrisi had many maps at his disposal and chose the most likely section from each to produce a comprehensive world map with Mecca centrally positioned and thus allowing for the over length of the Mediterranean Sea of both Marinus and Ptolemy to be utilised, and the Far East to be fitted into the remaining longitude of the 180 degree oikoumene. But, we must bear in mind that Marinus the Tyrian had an oikoumene length of 225 degrees, which Claudius Ptolemy reduced to 180 degrees by a simple geometric transfer of the farthest places, Sina Metropolis and Cattigara plus Labadius Island, as texts Mt1 and Mt2 illustrate. It only remains for us to ask, if Al-Idrisi had both the map of Marinus the Tyrian and text, plus the text and world maps of Claudius Ptolemy, why is his geography so strange and possibly reliant upon religious texts and not those of geographers? 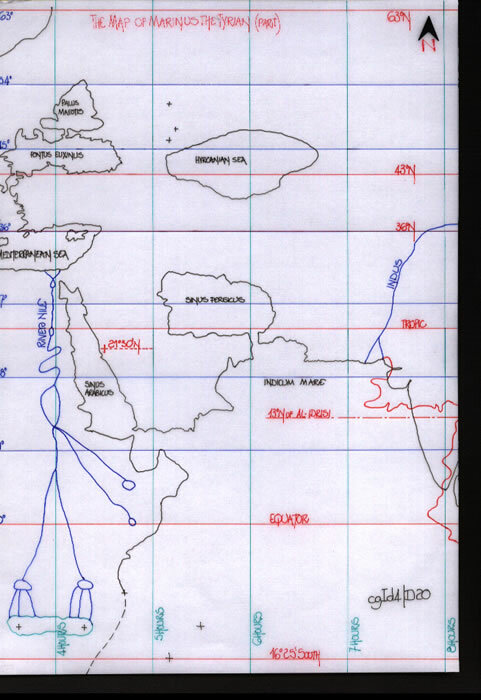 There does not appear to be a large scale Arabic Rectangular Map of the World at this period and thus we can assume only Marinus/Ptolemy maps were available. This of course omits the possibility that a Roman World map, such as that of Marcus Vipsanius Agrippa could have been available as a copy from that exhibited in Rome c6BC to c25AD (text cgPl2). The overall 70 tableaux map of Al-Idrisi has been compared to the overall maps of Marinus the Tyrian and Claudius Ptolemy. 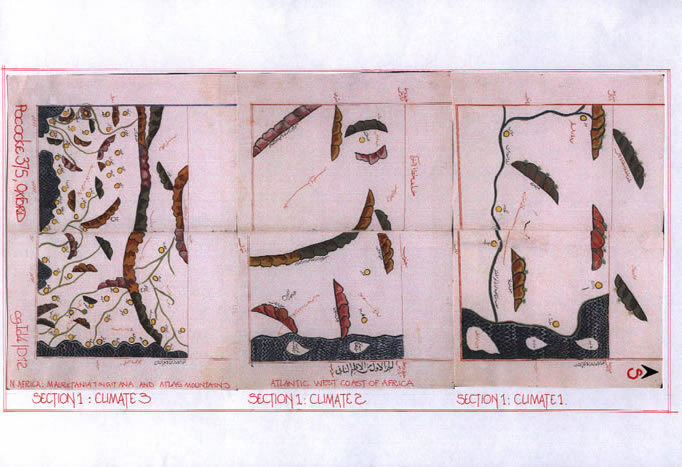 Diagrams cgId4D18 and cgId4D19 (they join to form one diagram) are an overlay of the map of Marinus upon the conjoined 70 tableaux map of Al-Idrisi. 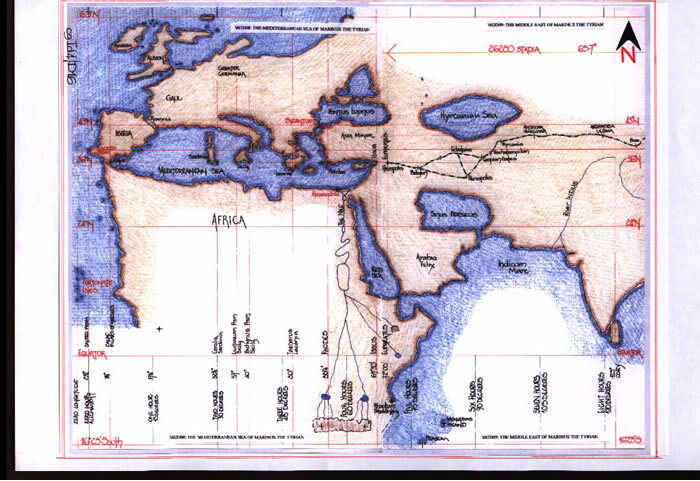 It is obvious that the scale of the map by Al-Idrisi is suspect; he has used the partial longitudinal distances of Marinus but reduced the latitudes such that they are actually unrecognisable as the diagrams illustrate. In effect with a length of the Mediterranean Sea comparable on each map, and other features aligning quite accurately it is strange that the latitudes should have been so reduced. That the overall length of his world is also foreshortened, which has been previously discussed does not provide for an analysis of the whole oikoumene. Diagrams cgId4D20 and cgId4D21 indicate the world of Marinus the Tyrian at least to the 180 degree longitude (the world of Marinus extended to the 225th longitude), and indicate how foreshortened the world map of Al-Idrisi actually was in comparison to the map it is plausible he used as the basis for his 70 section rectangular map. The 70 tableaux when joined to form a single map give the distinct impression that the coastlines have been drawn from solely verbal descriptions, probably by mariners but without a geographical notation to confirm directions. It also shows a world that was drawn by a person without any real knowledge of the shapes of various coastlines, islands etc. even though better maps were available to indicate the geography. The North African littoral is an example; no doubt mariners described the two great bays, the Little and Great Surt, which have been drawn but vastly exaggerated. But the coastline of West Africa bears a good resemblance to that of Marinus/Ptolemy and is therefore likely to have been copied. Italy is abysmally shaped, but Arabia is well portrayed. Greece is turned through 90 degrees with the Peloponnese east of the Gulf of Corinth and Northern Greece instead of south. It is wrongly orientated. The southern coastline of Asia Minor does not slope to the South-East, and the Pontus Euxine to its north is also abysmally shaped with no Palus Maeotis. India has the form given to it by Ptolemy with the island of Taprobane to its south, but there is no Golden Chersonesus, Great bay etc. recognisable to the east. Thus it is necessary to ask again; if Al-Idrisi had the text of Claudius Ptolemy, even if he did not have the maps, he could have prepared a base map of greater accuracy than his own and amended it to include later geographical information. But, if Al-Idrisi only had Book 1 of Geographia, why has he only read part of it and ignored the major sections regarding the Climates and the Setting Out. It is quite obvious he either ignored or had no information regarding Britannia/Albion and relied entirely upon the Norman French description from their campaign of conquest as text cgId1 discusses. But it is in the Mediterranean Sea area that the greatest problems with the map of Al-Idrisi are so very apparent. This is an area sailed for millennia by Phoenician, Greek and Roman mariners and was well recorded by their geographers. The Arabs were latecomers to the area and had not fully explored. Thus they had not been able to map its intricacies, but, those are the geographers to whom Al-Idrisi has turned for information, when it should have been Greek or Roman geographers many of whom had extant papers. Thus when the map of Al-Idrisi is compared to just a single map drawn 1000 years earlier it is found wanting, out of scale and geographically challenged. Yes the map produced by Dr K Miller is a feast for the eyes, but it is doubtful that anybody in 1154AD saw such a map, let alone tried to use it geographically. Hence it has gone un-noticed in those times and in fact does not appear to have been copied by other geographers. Had it been available for use it would surely have been criticised and noted as non-geographical. 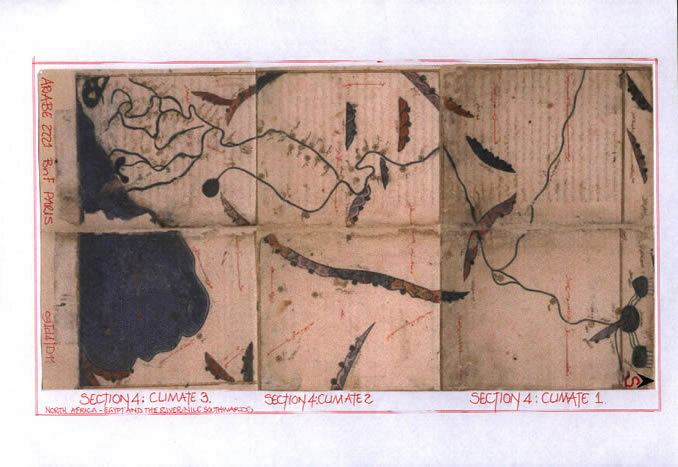 The 70 individual maps are actually of no use geographically unless it is to study a very small section of the oikoumene whilst reading the text. The circular map is likewise quite beautifully drawn; a lovely vignette of the world oikoumene, but it is also of very little geographical use. But, the co-joined 70 tableaux could have been the forerunner of many maps and aided the field of cartography by shortening the period before proper maps were drawn in Europe. Unfortunately, like the possibility of the 70 tableaux appearing originally as one map is a dream. M J Ferrar November 2012. PARASANGE; Arabia and Persia; 3 Arab Miles = 150 chaines d’arpentage = 1500 cassaba = 3000 Kathouah = 9000 coudees Hachemiques = 12000 coudees deraga cabda = 18000 pieds = 3.5792 statute miles or 5.760 kilometres. Egypt and Syria; 4 miles = 30 stades philiteriens = 3600 pas = 12000 coudees philiteriens = 4.0266 statute miles or 6.480 kilometres. COUDEE; La coudee hachemique ou coudee d’Omar (deraga akhdam) etait 1/3rd du Kathouah et faisait 1 1/3rd coudee de 24 doigts ( deraga cabda0 = 2 pieds = 2 2/3rds empans ( schibr) = 8 palms = 32 doigts arabes, or, 25.197 inches, 640mm. La Coudee de 24 doigts arabes (derag cabda) faisait le ¼ du Kathouah et = 1/1/2 pied = 2 empans(schibr) = 6 palms = 24 doigts = 18.898 inches or 480 mm. DOIGT; le doigt (assbaa) des arabes etait 32nd part of coudee hachemique or 24th part of la coudee deraga cabda divided into 6 grains d’orge or 36 crins de cheval = 0.7874 inches or 20mm. Egypt/Asia, le doigt = 24th part of coudee naturelle, 28th part of coudee royale, or 0.7382 inches, 18.75 mm and thus the natural coudee or cubit is 450mm. GEOGRAPHIE D’EDRISI, TRADUIRE PAR PIERRE AMEDEE JAUBERT. MDCCCXL, PARIS. Nuzhat Al-Mushtaq Fi’Khtiraq Al-Afaq, known as ‘The Book of Roger’. This text is available on line as a Google Book digitized download. J. Lennart Berggren and Alexander Jones, Ptolemy’s Geography, an annotated translation of the theoretical chapters, Princeton University press, 2000. See my texts, Cp1, Cp2, Cp3, Cp4, Ca1, and cgPt1. E L Stevenson, Translation of complete text, including all Books, Dover Publications New York 1991. AL-IDRISI PAPERS BY OTHER AUTHORS. Paul Lunde.” Pillars of Hercules, Sea of Darkness”, includes the Mugharrirun storyline. S. Maqbul Ahmad, ‘History of Cartography’ volume 1, chapter 7, “Cartography of al-Sharif al-Idrisi”. The complete text of Volume 1 is now available on line for download. AL-IDRISI TEXTS ON THIS SITE. cgId1; A DESCRIPTION OF L’ANGLETERRE. cgId3; THE WORLD MAP OF AL-IDRISI. cgId4; PREFACE, PROLOGUE, AND 70 MAPS. There will be other short papers on individual countries. 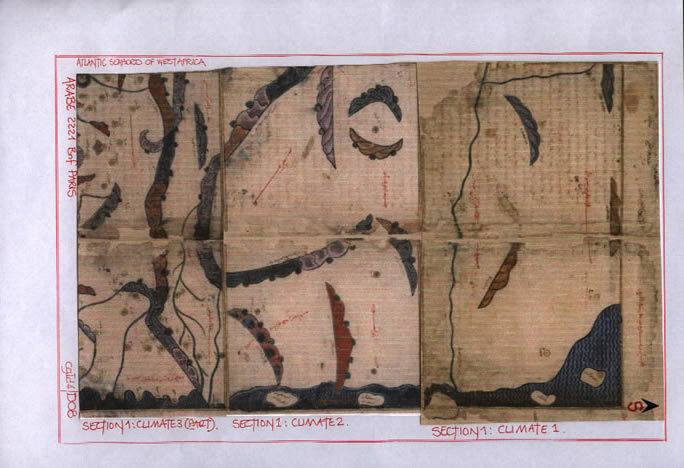 THE 70 (69) MAPS WITHIN THE TEXT OF AL-IDRISI. Cote: Arabe 2221, Auteur titre, Idrisi, Nuzhat al-Mustaq fi ihtiraq-al-afaq. Images 1-69 et planche contact 1-8. Masterpieces of the non-Western book. There are the 70 tableaux on two pages. Doursther, Horace. “Dictionnaire universel des poids et mesures ancient, contenat des tables des monnaies de tous les pays.” Brusels, M Hayez, Imprimeur de L’Academie Royale, 1840. Institute for the history of Arabic-Islamic Science at the Johann Wolfgang Goethe University, 1927. 6 volumes, being volume 241 of Islamic Geography.